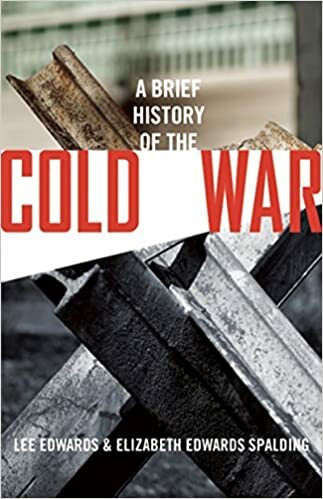 The following Cold War timeline is an excerpt from Lee Edwards and Elizabeth Edwards Spalding’s book A Brief History of the Cold War It is available to order now at Amazon and Barnes & Noble. Led by Vladimir Lenin, the Communist Revolution in Russia puts the Bolsheviks in power. The Russian Civil War ends with the establishment of the Union of Soviet Socialist Republics; Joseph Stalin is appointed general secretary of the Communist Party. Lenin dies after a long illness. Stalin consolidates all political power, ruling the Soviet Union with an iron hand until his death in 1953. The Molotov-Ribbentrop Pact, also known as the Nazi-Soviet Pact, splits Poland and the rest of Eastern Europe between the USSR and Nazi Germany. Yalta Conference. Roosevelt, Churchill, and Stalin, meeting in the Crimea, agree on free and open elections in Eastern Europe and divide Germany into four occupation zones. Franklin D. Roosevelt dies; Harry S. Truman becomes president. V-E Day. Allies celebrate victory in Europe after the unconditional surrender of Nazi Germany. Potsdam Conference. Meeting in Potsdam, Germany, Truman confirms Stalin’s plans to enter the war against Japan. Atlee replaces Churchill as prime minister of Great Britain. U.S. and Britain object to Soviet policies toward Poland and the Black Sea. V-J Day. Allies celebrate Japan’s unconditional surrender. World War II ends with Soviets retaining most of the territories they held in 1939 and areas occupied during the war, including parts of Austria, Germany, and Korea. Communists formally control governments in Albania, Bulgaria, and Romania. Soviets install communist government in northern Iran. Stalin announces that conflicts between the West and USSR are inevitable, charges that capitalism caused World War II, and calls for an industrial build-up in Russia. George Kennan sends the Long Telegram from Moscow to Washington, describing inherent Soviet hostility toward Western capitalist societies, especially the United States. Churchill delivers his Iron Curtain speech in Fulton, Missouri, proposing an Anglo-American alliance against international communism. After months of diplomatic protests by the United States, Great Britain, and the United Nations, the Soviets withdraw from Iran. Truman orders preparation of task force to send to the eastern Mediterranean. The USSR pressures Turkey to agree to joint control of the Turkish Straits, beginning naval maneuvers in the Black Sea and dispatching troops to the Balkans. In response to a plea from the Turkish government, Truman orders a naval task force to the area and affirms U.S. support of Turkey. Attempted communist takeover intensifies civil war in Greece. Communists take power in rigged Polish elections in violation of Yalta agreements. The British officially inform the United States they can no longer guarantee the security of Greece and Turkey. Truman Doctrine. Announcing aid to Greece and Turkey, Truman proposes a policy of supporting free people against anti-democratic forces from within or outside national borders. Marshall Plan: With Truman’s full backing, Secretary of State George Marshall announces a multi-billion-dollar European Recovery Program of economic aid. “Sources of Soviet Conduct” by “X” (George Kennan) published in Foreign Affairs, advocating policy of containment of the Soviet Union. National Security Act signed into law, reorganizing the U.S. military under the Department of Defense and establishing the Joint Chiefs of Staff, the National Security Council, and the CIA. Communist coup in Czechoslovakia. Soon after, Congress passes the European Recovery Program (the Marshall Plan). UN-supervised free elections lead to the formation of the Republic of Korea in the south; Soviet Union declares the Democratic People’s Republic of Korea in the north to be the legitimate government of all Korea. Whittaker Chambers accuses Alger Hiss of espionage at open congressional hearing. Communists formally take over Hungary, arresting and executing opponents and controlling the secret police; Cardinal Joseph Mindszenty, primate of Hungary, is imprisoned on December 26. Harry S. Truman is sworn in again as president. Formation of the North Atlantic Treaty Organization (NATO), a twelve-nation military alliance intended to protect Western alliance members and contain Soviet expansion. The Federal Republic of Germany is established in West Germany; the Soviets declare their zone of East Germany to be the German Democratic Republic. Soviet Union tests an atomic bomb. Mao Zedong declares the birth of the People’s Republic of China after a long civil war between the communists and Chiang Kaishek’s Nationalists; Chiang and other anticommunist Chinese move to the island of Formosa (Taiwan) and set up the government of the Republic of China. Truman approves development of the hydrogen bomb. Senator Joseph McCarthy claims that communists have infiltrated the U.S. State Department. The USSR and the People’s Republic of China sign a pact of mutual defense. Communist North Korea invades South Korea with military support from the Soviet Union. Truman and the United Nations call for a defense of South Korea. United States sends forces (eventually joined by forces from sixteen other countries) led by General MacArthur to Korea. Truman approves NSC 68, the outline of a broad defense and foreign policy strategy to counter and challenge the Soviet Union. Julius and Ethel Rosenberg are convicted of espionage for their role in giving atomic secrets to the USSR during and after World War II. Armistice talks begin in Korea. The European Recovery Program ends, with European industrial output substantially higher than in 1948. Dwight D. Eisenhower is sworn in as president. Anticommunist riots in East Berlin suppressed by Soviet and East German forces. Armistice ends the fighting in Korea, but no peace treaty is signed. Nikita Khrushchev becomes head of the Soviet Communist Party; his main rival is executed in December. Dien Bien Phu falls to communist Vietminh in Vietnam. The first Taiwan Straits crisis occurs when the Communist Chinese shell Taiwanese islands; the United States backs the ROC. The Southeast Asian Treaty Organization (SEATO) is founded to resist communist aggression. Member states are Australia, France, New Zealand, Pakistan, Thailand, the Philippines, the United Kingdom, and the United States. U.S. Senate censures Senator Joseph McCarthy. The Baghdad Pact is formed to resist communist aggression in the Middle East, with member states Iran, Iraq, Pakistan, Turkey, and the United Kingdom. The United States becomes an associate member in 1959, when the pact is renamed CENTO after Iraq’s withdrawal. Warsaw Pact established by the USSR and satellites Albania, Poland, Romania, Hungary, East Germany, Czechoslovakia, and Bulgaria. Nikita Khrushchev delivers his “secret” de-Stalinization speech at the Twentieth Communist Party Congress. Anticommunist protests in Poznan, Poland, are crushed by communist Polish and Soviet forces. First American U-2 reconnaissance flights over the Soviet Union. During the Suez Canal Crisis, Eisenhower pressures Britain and France to accept a UN ceasefire in order to prevent the USSR from assisting Gamal Nasser’s Egypt and expanding Soviet presence in the Middle East. Hungarian Revolution begins, but after two weeks of freedom, students and workers protesting Soviet occupation are violently put down and communist rule is reestablished. Communist insurgency sponsored by North Vietnam begins in South Vietnam. Fidel Castro arrives in Cuba, where he will lead a revolution and establish a communist state. Eisenhower Doctrine—a commitment to defend the Middle East from communist aggression—is announced. Spuknik I satellite launched by the Soviet Union. Khrushchev publicly claims Soviet missile superiority over the United States, but U-2 flights secretly confirm U.S. superiority. The Common Market established by Western European nations. Mao begins the Great Leap Forward, a collectivization of Chinese agriculture that will cause the deaths of tens of millions. The second Taiwan Straits crisis begins with communist Chinese bombing of Quemoy. The second Berlin crisis begins, with Khrushchev demanding that the West leave Berlin. The “Kitchen Debate,” an exchange between Khrushchev and Vice President Richard Nixon about the relative levels of abundance produced by capitalism and socialism, takes place at an American cultural exhibition in Moscow. The exchange is captured on videotape and broadcast in the United States and the USSR. Khrushchev is the first Soviet premier to visit the United States. Khrushchev announces that the USSR has shot down an American U-2 plane and captured its pilot. United States suspends U-2 flights. Communist revolt in Laos begins. Khrushchev vehemently protests against American and Western policies at the United Nations, publicly embraces Fidel Castro. Diplomatic relations between the United States and Cuba end. John F. Kennedy is sworn in as president. Bay of Pigs invasion. Cuban exiles organized by the CIA land in Cuba, seeking to spark an uprising against Castro’s regime. President Kennedy withholds vital air and naval support, and the mission fails. First U.S. military advisors are sent to Vietnam. Berlin border is closed by East Germany, followed by construction of the Berlin Wall dividing East and West Berlin. The wall cuts off the flow of thousands of East Germans seeking to migrate to the West. USSR detonates the most powerful thermonuclear weapon ever tested, with an explosive yield of some fifty megatons. Communist Chinese forces attack India and make claims on numerous areas along the Himalayan border. Cuban Missile Crisis erupts when the United States discovers Soviet nuclear missiles in Cuba capable of striking U.S. targets. Kennedy imposes a quarantine and demands the missiles’ removal. The Soviets acquiesce, acknowledging the superior military strength of the United States, while the United States agrees to remove its nuclear missiles from Turkey. Publication of Aleksandr Solzhenitsyn’s One Day in the Life of Ivan Denisovich, based on the author’s experiences as a prisoner in the Gulag. Hotline enabling direct communication between the White House and the Kremlin is opened. Kennedy delivers his “Ich bin ein Berliner” speech in Berlin. Nuclear test ban treaty between United States, Soviet Union, and Great Britain is signed. Ngo Dinh Diem, president of Vietnam, is overthrown and assassinated. President John F. Kennedy is assassinated by Marxist Lee Harvey Oswald; Lyndon Johnson is sworn in as president. Senate passes the Gulf of Tonkin Resolution, authorizing U.S. military action in Vietnam. Khrushchev is replaced by Leonid Brezhnev as general secretary of the Communist Party of the Soviet Union. Communist China tests its first atomic bomb. Lyndon B. Johnson is elected president. Extensive U.S. bombing (Operation Rolling Thunder) begins in Vietnam. First U.S. combat troops arrive in Vietnam. The Cultural Revolution begins in the PRC. Thousands of demonstrators picket the Pentagon in protest against U.S. involvement in Vietnam. North Korea captures USS Pueblo; captain and crew are released in December. “Prague Spring” begins in Czechoslovakia. Tet Offensive begins in South Vietnam. Richard Nixon is sworn in as president. Clash between troops of Soviet Union and People’s Republic of China along their joint border. President Nixon begins “Vietnamization” of the war in Indochina and announces gradual withdrawal of U.S. troops from Vietnam. Nixon Doctrine: A pledge to honor treaties, provide a nuclear shield to allies, and provide arms and economic aid to other nations but not U.S. troops. Nuclear Non-Proliferation Treaty is ratified. Nixon announces invasion of Cambodia. Four students killed in protests at Kent State University. Nonaggression pact between West Germany and the Soviet Union signed. United States ends trade embargo on the People’s Republic of China. India and the USSR sign a twenty-year friendship pact. Nixon becomes the first U.S. president to visit the People’s Republic of China. First Strategic Arms Limitation Treaty (SALT I) and Anti-Ballistic Missile Treaty (ABM Treaty) signed by United States and USSR. Break-in at the Democratic National Committee headquarters in Washington, beginning the Watergate scandal. Vietnam Peace Agreement signed in Paris. After publication of The Gulag Archipelago in the West, Solzhenitsyn is arrested and exiled from the USSR. Richard Nixon resigns the presidency in the face of certain impeachment and conviction and is succeeded by Gerald R. Ford. Communists take power in Ethiopia. Cambodia falls to communist Khmer Rouge, who over the next two years engineer the death of one-fifth of the Cambodian population. Saigon falls to the North Vietnamese after U.S. Congress refuses further aid, ending the Vietnam War in a communist victory. Khmer Rouge seizes the American merchant ship Mayaguez in disputed waters off Cambodia. The ship is recaptured with heavy U.S. casualties in the last official engagement of the Vietnam War. Communists take power in Angola and Mozambique. Western powers and USSR sign the Helsinki Accords. The West accepts Soviet borders and increased trade, while Soviets promise to recognize certain human rights. Communists take power in Laos. Mao Zedong dies; Cultural Revolution ends. Charter 77 is signed by Czechoslovakian dissidents, including Václav Havel. Jimmy Carter is sworn in as president. After years of protesting Soviet repression, especially of Jews, Natan Sharansky is found guilty at a show trial. He will spend years in prisons in Moscow and the Perm Gulag in Siberia. Soviets continue arms buildup in Eastern Europe, including deployment of SS-20 missiles that can reach targets in Western Europe. Karol Wojtyła, archbishop of Krakow, Poland, elected pope, taking the name John Paul II. United States and People’s Republic of China establish diplomatic relations. U.S. ends official diplomatic relations with longtime ally the Republic of China on Taiwan. Margaret Thatcher becomes prime minister of Great Britain. Pope John Paul II visits Poland. Carter and Brezhnev sign the SALT II agreement. Communist Sandinistas, supported by Cuba, topple the Nicaraguan government. Iranian militants attack U.S. embassy in Teheran and seize fifty-two hostages, beginning the 444-day Iran hostage crisis. NATO announces dual-track decision to deploy long-range theater nuclear forces in Western Europe and offers to negotiate with the Soviets on nuclear weapons in Europe. The Soviet Union responds to a coup in Afghanistan by invading and establishing a pro-Soviet government, becoming entangled in a decade-long civil war. Russian dissident and Nobel laureate Andrei Sakharov protests the Soviet invasion of Afghanistan and is exiled to Gorki, a city closed to foreigners. Carter Doctrine: the United States will respond with force if any country attempts to control the Persian Gulf and threaten U.S. interests there. Communist Polish government legalizes the Solidarity trade union. After campaigning on a pledge to restore U.S. military superiority, Ronald Reagan is elected president. Reagan sworn in as president; Iran hostage crisis ends. United States suspends aid to Nicaragua. Polish government arrests Solidarity leaders and declares martial law. Leonid Brezhnev dies and is succeeded by Yuri Andropov as head of USSR. Reagan announces the Strategic Defense Initiative (SDI). Soviets shoot down civilian Korean Air Lines Flight 007, flying from Anchorage to Seoul, purportedly in Soviet airspace, killing all 269 aboard, including a member of Congress. U.S. forces overthrow the Marxist regime in Grenada and restore democracy. Deployment of U.S. cruise and Pershing II missiles in Western Europe begins. Reagan Doctrine: the United States will support anticommunist fighters in Afghanistan, Nicaragua, Angola, and Cambodia. After the deaths of Yuri Andropov and Konstantin Chernenko, Mikhail Gorbachev becomes general secretary of the Communist Party and leader of the Soviet Union. Reagan and Gorbachev meet for the first time at a summit in Geneva and agree to hold more summits. Reagan and Gorbachev agree at Reykjavik to remove all intermediate nuclear missiles from Europe; after offering to share nuclear technology, Reagan refuses to give up SDI, which leads to end of the summit. Gorbachev and Reagan sign the INF Treaty, eliminating an entire class of nuclear weapons for the first time. Soviet Union announces its withdrawal from Afghanistan. Speaking at Moscow State University, Reagan says that “it’s time” for a new world of friendship, peace, and freedom. Gorbachev renounces the Brezhnev Doctrine, saying the USSR will no longer interfere militarily in Eastern Europe. Soviet troops withdraw from Afghanistan. Czech police put down demonstrators, arrest Václav Havel. George H. W. Bush is sworn in as president. Sandinista government agrees to free elections in Nicaragua. In the first partially free elections in the Soviet Union, non-Communists are elected to the Congress of People’s Deputies. Hungary begins to remove the fence separating it from Austria. Tiananmen Square Massacre. After weeks of pro-democracy demonstrations, Chinese troops and tanks forcibly end demonstrations, killing hundreds and perhaps thousands of students. In free Polish elections, Solidarity defeats the communists. Imre Nagy, the leader of the 1956 Hungarian Revolution, is given a hero’s burial in Budapest. Massive popular protests begin in Leipzig, East Germany. Berlin Wall falls: travel restrictions are lifted, and many thousands of East Germans flood into West Germany. Romanian dictator Nicolae Ceausescu is overthrown and executed. Václav Havel becomes president of Czechoslovakia, leading its first non-communist government since 1948. Lithuania declares independence from the Soviet Union. Estonia and Latvia soon follow. Communist Party loses its monopoly of power in the Soviet Union. Conventional Armed Forces in Europe Treaty and the Charter of Paris for a New Europe are signed, bringing the Cold War closer to an end; the USSR, however, continues to exist. Hard-liners in the Politburo attempt a coup, placing Gorbachev under house arrest. Boris Yeltsin rallies the people against the Gang of Eight and the coup collapses. Gorbachev resigns as president of Soviet Union after Russian president Yeltsin bans the Communist Party and assumes all the powers of the old regime. The USSR dissolves, and the Cold War officially ends. Soviet Union is replaced by fifteen independent states led by Russia. This Cold War timeline is an excerpt from Lee Edwards and Elizabeth Edwards Spalding’s book A Brief History of the Cold War. It is available to order now at Amazon and Barnes & Noble.